Place the mouse cursor over an identifier in the editor while holding down the Ctrl key. The identifier becomes a hyperlink, and a list of navigation options is displayed. The first option is Open Declaration. This is the default action when you click directly on the identifier. Hyperlinks are available for all classes, modules, methods, fields, signals, macros, etc. in the source code files that DVT analyzes in your project. Open Declaration Tip: Keyboard alternative: place editor cursor on an identifier and press F3. Open Child Implementation Available only if the method under cursor is overridden in a subclass. If there is only one override, it is opened. 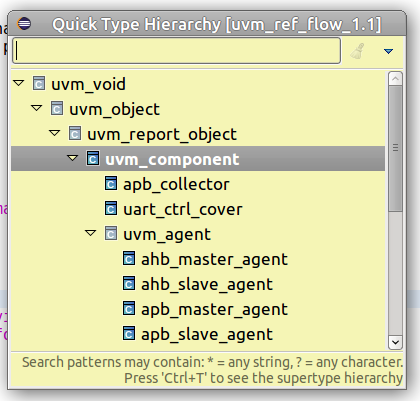 Otherwise the Quick Type Hierarchy View is opened. Open Instance Available only for a design element under cursor which is instantiable. It jumps to the corresponding instance from design (which is also available in the Design Breadcrumb Navigation Bar). Jump to Assignment Jumps to the next assignment of the signal under cursor in the current editor. Jump to Case Branch Available only on enum constants and parameters. Jumps directly to the case branch where element under cursor is used.